Feature-length animated film Studio Dreamworks Pictures 'Madagascar 3: most wanted in Europe", included in the first rental month in the top 50 highest-grossing animated films, its success owes much high level VoiceOver work of well-known actors who gave their voices on-screen heroes. For scoring the third part of one of the most profitable entertainment projects in recent years were invited the main cast of actors who worked on the first and second "Madagascar". So, in the original English version of Alex the lion, who dreams to come back after Madagascar to hometown new York zoo again spoke with the voice of a famous Hollywood comedian Ben Stiller. A close friend of Alex, the male Zebra named Marty voiced by Chris Rock, known to Russians on the film "Beverly hills 2" and the TV series "everybody hates Chris". The virtual role of hippopotami Gloria tried on the wife of will Smith, actress and model jada Koren Pinkett Smith. Well, her on-screen lover, melancholic, giraffe Melman, became of David Schwimmer, whom the world knows as Ross from the TV series "Friends". Was not forgotten and the "star" of the previous cartoons, king of the lemurs Julien: he continued his journey across Europe with the main characters, still speaking voice controversial actor Sacha Baron Cohen. 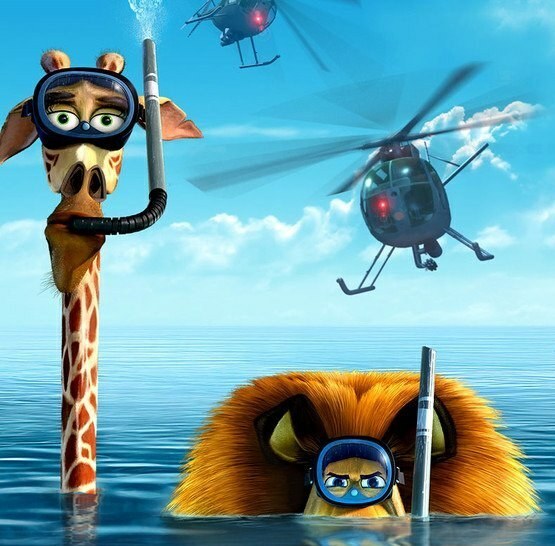 The events in "Madagascar-3" develop so that the scene is not only old but also many new characters. It is not surprising that the Studio Dreamworks Pictures in front of the creation of the cartoon ran a solid contest among famous actors and singers who want to join the team, "madagaskaras". Among those lucky enough, was a nominee for the award "Oscar" in 2012, the performer of the role of the villain in the drama "the help Jessica Chastain. She had the honour to voice the female Jaguar Gia, circus actress, who conquered the heart of a lion Alex. Colleague GE at the circus, Vitaly the Siberian tiger, "played" voice writer, actor and Director Bryan Cranston, the main character of the series breaking bad. The Russian version of "Madagascar 3" also is replete with famous actors invited to the dubbing of the cartoon. For Russians, Alex speaks in the voice of keira Knightley, Marty - Oscar Kuchera, Gloria - Masha Malinovskaya, and Melman is given by Alexander Tsekalo. King Julian was voiced by a famous actor dubbing Andrew Levin: it is the voice of the heroes of the cartoon "wall-e", "fly me to the moon", "Percy Jackson and the lightning thief", "toy Story. The great escape" and many others.